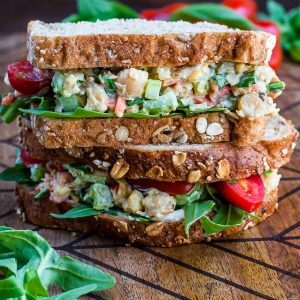 Tomato Basil Chickpea Salad Sandwich FTW! Whip up this healthy vegetarian chickpea salad in advance for speedy make-ahead lunches or picnic eats. I only had grape tomatoes handy but feel free to grab roma, heirloom, beefsteak, or any tomatoes of your choosing. As long as they're ripe this sandwich will rock! Chop your green onion, celery, shredded carrots, pepper. Add to the bowl with your chickpeas, then add mayo, dijon, yellow mustard, salt, and pepper. Stir well to coat. Fold in sunflower seeds and chopped basil (as much or as little as you'd like) and adjust any ingredients to taste. Get creative with your chickpeas, yo! Pile high on bread with all your sandwich fixings or enjoy as a wrap, with crackers, on a salad, or simply dive into the bowl spoon-first like I tend to do. Enjoy! No sunflower seeds? No problem! Chopped walnuts also work great. Adapted from (affiliate) The Oh She Glows Cookbook + a variation of my beloved Garden Veggie Chickpea Salad Sandwich.